Groucho Marx? Marshall Reid? Fanny Brice? Frank Case? Jane Ace? Goodman Ace? Rudy Vallée? Verree Teasdale? Robert Bloch? Ann Landers? Anonymous? The pun has also been attributed to hotelier Frank Case and radio performer Jane Ace. Would you please explore this saying? Quote Investigator: Groucho Marx did deliver this comical line during the film “Go West” in 1940, but the expression was already in circulation. In addition, there is good evidence that Frank Case, Jane Ace and several other individuals employed the joke. Detailed citations are given further below. In a Chicago cafe the other night, an elderly man passed a table. We don’t have much trouble with skippers. If a man can’t pay his bill he usually tells me; pays me later. Of course, they’re a few heels who get away with things, but eventually as time goes by they all get caught. What I always say is “Time wounds all heels”. Winston Churchill? Rudy Vallee? Army Captain? The Strand Magazine? Anonymous? This is the type of impertinence up with which I shall not put. I enjoy this story and have retold it on numerous occasions because it demonstrates how clumsy a sentence can become when it is mechanically rewritten to comply with a nonsensical prohibition. Sadly, I have learned that his tale may be false. Could you explore this topic? Quote Investigator: This famous tale has attracted the interest of many researchers over the decades. 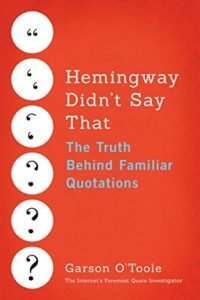 Ben Zimmer, a brilliant linguist who writes for the Wall Street Journal on the topic of language, obtained the pivotal citations and located an instance of the comical phrase in the Wall Street Journal of September 30, 1942. The text referred to an earlier appearance in The Strand magazine but it did not provide an exact pointer [BZCQ] [WJGP]. It is conceivable that this story was based on an actual incident, but the other jokes on the page emphasized humor over plausibility and used generic figures such as: “the black marketeer”, “a noted prima donna”, and “the perplexed young man”. Veracity was probably forfeited to comedy. Winston Churchill was connected to this joke in a multi-step process that began in 1944 with a cable sent from England to North American newspapers, but tracing this tale is complicated because some newspapers apparently insisted on rewriting the key phrase. It is possible that zealous newspaper copy editors did not quite understand the intended humor and printed a garbled version of the jest. Alternatively, someone on Churchill’s staff did not fully understand the gibe and sent a phrase with a different word order. The earliest citation located by QI that attributed the comical phrase with the proper word order to Churchill was dated September 15, 1945. Specifically, the phrase “up with which I will not put” was credited to him. The details of the evolving quip are given below with additional selected citations in chronological order.